NES EarthBound Beginnings (JPN) "warp glitch" in 23:09.56 by pirohiko. 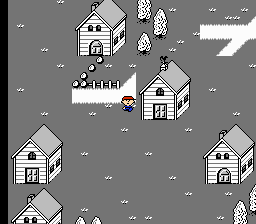 This is the JPN version of EarthBound Beginnings (also known as Mother (マザー) ). As the first version of the game, it has a number of useful glitches; this run abuses the way the game handles the "Bread crumbs" item to warp off the edge of reality and casually walk straight into the final boss's lair two and a half minutes faster than the previous run.